"This is a plan for world conquest. Manchuria is just the beginning. All of China, the Americas!" During the last days of World War II, when Germany lay in the ashes of defeat and Japan remained the only Axis power still standing, Hollywood went after the Nipponese menace with a gusto. 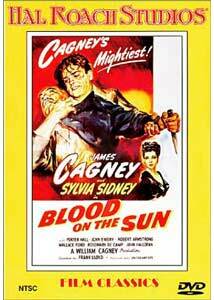 One of the most notable films in this subgenre is the James Cagney vehicle Blood in the Sun. Vaguely based on real events, it is a rousing little thriller that hasn't aged too badly, other than in its racial attitudes. The story goes back to the years before the war, even to the late 1920s, when Japan's expansionist tendencies were only hinted at. The conquest of the Chinese province of Manchuria and its transformation into the puppet state of Manchukuo in 1932 were not yet accomplished. Cagney plays Nick Condon, crusading managing editor of the Tokyo Chronicle. His suspicions about Japan's dreams of conquest appear to be justified when the Imperial Police overreact to an article he publishes accusing Premier Tanaka (John Emery) and Col. Tojo (Robert Armstrong) of planning world conquest. When his reporter, Ollie Miller (Wallace Ford), suddenly turns up wealthy and leaving the country, Condon gets more suspicious. When Miller and his wife mysteriously turn up murdered, the suspicions are confirmed. Before dying—in best cinema fashion—Miller leaves Condon in possession of a document, the Tanaka Memorial, that confirms his guess. But the Japanese are on to the fact Condon has the plan, and a beautiful Chinese woman, Iris Hilliard (Sylvia Sidney) is soon seducing him in an effort to get the document as well. Pretty soon it's clear that Condon's life won't be worth a plug nickel if he can't somehow smuggle it and himself out of the country. Given the wartime background, it's not surprising that the Japanese are treated with little respect in this film (not to mention being played by Occidentals through and through). Every Japanese character is thoroughly loathsome, with the one exception: the aged Prince Tatsugi, who sees himself as a poet disguising the sword of the samurai, wielded by Tojo and Tanaka. Marvin Miller (of The Millionaire TV series many years ago) is utterly slimy and unctuous as the police chief, Yamada. His mincing and sleazy interpretation is hilarious, and is matched only by the incarnation of Saddam Hussein on South Park. The Japanese Imperial Secret Police (also called the Thought Police) are presented as thoroughly inept, being outwitted by "round-eyes" Cagney at every opportunity. Tojo is presented as a mincing and squeaky-voiced martinet, more an object of ridicule than fear. The direction is quite pedestrian. The camera barely moves, giving the picture a rather stagebound feeling. Cagney is earnest and entertaining as the reporter, making the right of the public to know seem as admirable as it did back during the Watergate scandals. Such a free-press oriented film must have been risky under wartime censorship and the coming McCarthyism that made it unsafe to express any opinions whatsoever. Of course, the fact that he was exposing enemy secrets surely made this First Amendment exercise far more palatable to audiences at the time. The drama is pretty effective, in general. The concluding sequence manages to generate a good bit of suspense. It's not Hitchcock, by any means, but for what it is, it's not bad. I have to admit, though, that it's pretty odd to see Cagney pretending to be a martial artist. Image Transfer Review: The full-screen image is taken from the original nitrate camera negative. On the positive side, this gives the picture a beautiful richness of detail and shading that the various public domain releases have been sorely lacking. On the down side, the various imperfections in the negative are reproduced as well, without any restoration visible at all. Most of the time, this isn't a problem, but there are occasional flurries of speckles and spots that make it look like Cagney is in a blizzard. The damage to the negative aside, the picture looks beautiful. Extras Review: Nani mo nai. Chaptering is hardly adequate either. An intriguing historical relic, with a bit of good suspense as well. This is definitely the version to get, if you want this movie. Worth a look for the curious.